Herzog Wine Cellars Baron herzog Cabernet Sauv. 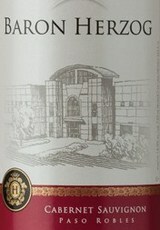 Since 1985, Baron Herzog has set a standard for quality California winemaking. Within this bottle rests a heritage of excellence spanning nine generations, and craftsmanship fit for royalty. Elegant and full bodied with rich notes of black stone fruit, boysenberry, nutmeg and a kiss of oak bring distinction to Baron Herzog Cabernet Sauvignon. Enjoy this wine at room temperature with grilled steak, lamb chops or pasta with red sauce.